courage noun: (1) the quality of mind or spirit that enables a person to face difficulty, danger, pain, etc., without fear; bravery. (2) to have the courage of one’s convictions, to act in accordance with one’s beliefs, especially in spite of criticism. When I was growing up in America, it never occurred to me that I would one day be faced with the situation I am today. I was raised with certain ideas: that our country really was founded on freedom and that all men are created equal in the eyes of God. These freedoms are elucidated and clarified in the Constitution and the Bill of Rights. I am supposed to have the right to free speech (not hate speech), I am supposed to have a right to practice my religion, (as does anyone else) and I am supposed to have the right to pursue liberty and justice for me and mine (not at the expense of others). However, the older I get, the more and more I am experiencing these same rights eroded by opinion, circumstance, political correctness, and worse yet, by laws. Yesterday, a young man took a stand in what he believed was his right. It is incredulous that his actions are even drawing all this attention (some supportive, some exceptionally critical). A high school senior, a young man of academic excellence and I suspect, exceptional character, stood up and challenged the “wisdom” of his elders, society and the laws of his state. Yes, indeed. 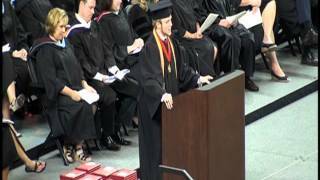 He dared to recite the Lord’s Prayer to his classmates and teachers at his graduation. Sad that it has come to this, that a young man of conscience has to “sneak” God into the public forum. I am betting the angels were clapping right along with some of those boisterous classmates yesterday. Personally, were I there I would have been on the bleachers yelling, “Hoop, there it is!” and applauding very loudly. I know I am not alone, across many ages, ethnicities and creeds when I say that life in this century leaves me wondering, “What next and how low can we go”? So, what can WE do? We are told in scripture that wide is the road to destruction and narrow is the gate to life. So we must choose. Not once. But everyday. We must choose to be the person who swims against the current, to stand in what you know is right, to love your friend and love your enemy…but mostly to trust in God, and trust in Jesus also, because He has already overcome the world. What that young man did was courageous. It shouldn’t have to be defined as that, but it is. For those who agree with him, it will not be easy going. It is most likely not going to get any better. But we are told to persevere anyway. 2 Timothy 3:10-17…But as for you, continue in what you have learned and have become convinced of, because you know those from whom you learned it, 15 and how from infancy you have known the Holy Scriptures, which are able to make you wise for salvation through faith in Christ Jesus. 16 All Scripture is God-breathed and is useful for teaching, rebuking, correcting and training in righteousness, 17 so that the servant of God[a] may be thoroughly equipped for every good work. I’d say it is time….Time to get out of our seats.